Luso Scot: Orange walk in Edinburgh! Today I was happily working (yes, I'm being ironic) when my friend told me to be careful if I went out on the street. The reason for this was an orange walk in Edinburgh and the fact that I'm Catholic. Can you believe it? Such a peaceful city receiving an orange walk! Now, for those of you who don't know what an orange walk is, it's not the world's best proof of solidarity and brotherhood among Christians. Basically the organizers are free-masons celebrating something like "protestant pride". * These orange walks are especially common in Northern Ireland where they are seen as a provocation to Catholics. Now, why on earth would someone in good old civilized UK want to provoke other religious people is out of my understanding. We live in a time when thousands of Christians of different denominations are being massacred for their faith by Islamic fundamentalists in the "Isis Caliphate", Nigeria, etc.... A time when Christians are not allowed to practice their faith freely by Communist governments in North Korea, China or Cuba... A time when you can still be stonned to death if you're a Muslim and convert to Christianity (or any other religion) in countries like Saudi Arabia and Iran! * Would it not be obvious that different Christian faiths would join efforts and energies in doing something about these awful situations instead of parading their pride as a provocation to other Christians? This is not to say that Catholics were always bright examples of brotherhood for other Christians. The inquisition, for example, was not known to be very respectful of doctrinal differences. But this is the XXI century Western Europe! Surely these orange-men can grow out of past differences! 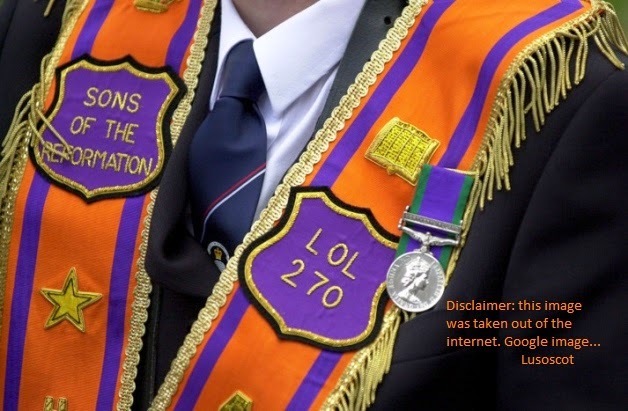 * The explosive cocktail of free masonry with protestant pride must surely mean Catholics should be aware! * More examples can be found here.